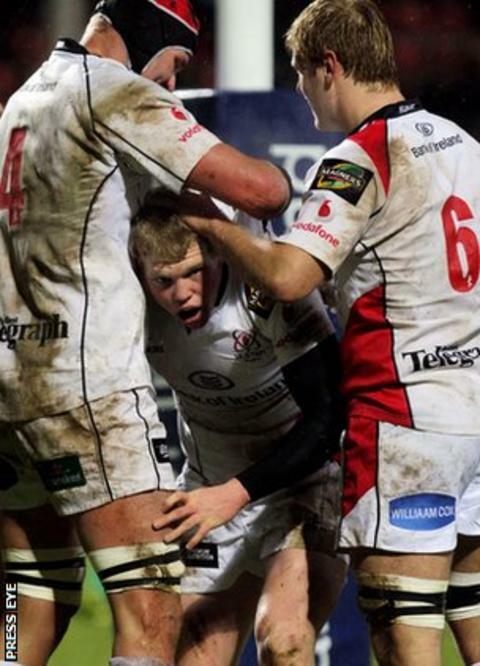 Ulster captain Johann Muller has said Nevin Spence "will never be forgotten as long as this great club exists". In a statement released on behalf of the entire Ulster squad, Muller expressed "heartfelt sympathy" at the tragic death of the centre and his father Noel and brother Graham. "Nevin's loss will be felt deeply by us all," said Muller's statement. "We are equally saddened by the tragic deaths of his father Noel and his brother Graham." Muller added that "the thoughts of every member of the squad are with Nevin's mother Essie, and his sisters Emma and Laura". The deaths of Ulster star Nevin Spence, his brother Graham and father Noel have stunned Ravenhill and club side Ballynahinch. "We would also like to pass on our condolences to Graham's wife and children. We wish Emma a full and speedy recovery." The Ulster captain said Spence was "a highly skilful and gifted rugby player". "He was utterly committed to Ulster and was enormously proud to represent his province. "He was determined to be the best that he could be and I have no doubt that he would have gone on to play for Ireland on many occasions. "He was the kind of player that inspired others with his attitude in training and sheer will to win in matches." Muller added that the centre's "positive outlook on life brought a smile to people's faces". "He was kind, polite, generous and courageous, and we were blessed to have him in our team. Ulster centre Nevin Spence appeared destined for a long and successful career with province and country. "The one comfort for us as a squad is that we have each other for support. "It has been a difficult time for the players and coaches but I believe that through this tragic loss, we will have a new sense of togetherness." Muller thanked those who have sent messages of support to Ulster since the weekend farming accident which claimed the lives of the three Spence family members. "It is clear from these messages that Nevin was highly regarded by players and fans of many different sports, in many different countries." The Ulster skipper also thanked the Pro12 authorities for granting a postponement of this weekend's scheduled match in Italy against Zebre. "In the coming weeks, the Ulster Rugby team will return to the pitch," added Muller. "Over the course of the rest of this year and in future seasons we will experience wins and we will no doubt suffer defeats. "Players will move on or retire and new players will come in and represent the province.